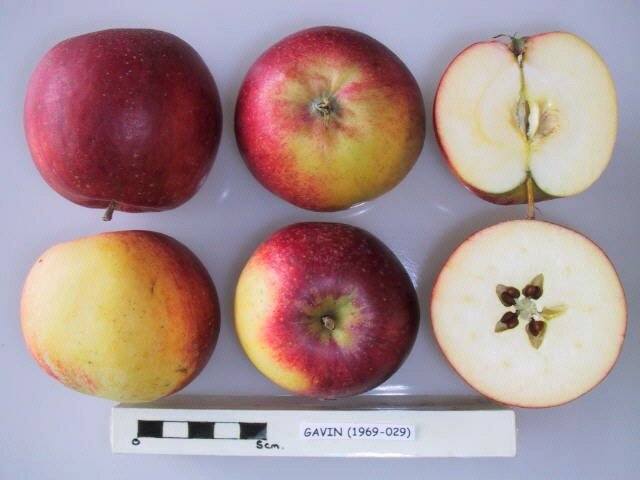 Gavin is an interesting and fairly early attempt (1950s) to develop a variety with natural resistance to "scab", one of the most prevalent of diseases of apple trees, by using a crab-apple variety as a starting point. Whilst the crab-apple lends its natural disease resistance, fortunately its bitter acidic flavour is not present in Gavin. Instead, in appearance and flavour, Gavin is very much closer to its parent Merton Worcester, which is in turn a cross between Cox's Orange Pippin and Worcester Pearmain. It is named after its creator, Gavin Brown who worked at the famous John Innes Institute in the 1950s. Gavin is a somewhat un-prepossesing apple, fairly small by modern standards. The colour is usually light yellow with a strong red flush typical of Merton Worcester and Worcester Pearmain. The flesh is firm rather than crunchy, but not soft. When it comes to flavour Gavin acquits itself far better than might be expected. It is quite delicate, tending towards sweet, without too much acid. 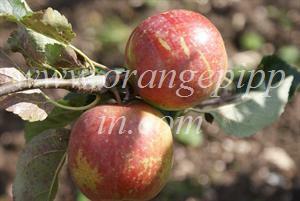 It will be popular with anyone who wants an apple which is not too acidic and at the same time not too sugary-sweet. In fact in many ways Gavin is the apple that Merton Worcester was supposed to be - a marriage of the up-front summery flavours of Worcester Pearmain with the serious complexity of Cox's Orange Pippin. Merton Worcester ended up being essentially an improved Worcester Pearmain - but in Gavin the Cox inheritance starts to show through, giving a delicate aromatic flavour. Gavin makes an excellent apple variety for the garden. It is quite easy to grow and has good disease resistance. The blossom is also notably attractive - perhaps a result of its crab-apple ancestry. It is perhaps surprising that Gavin is not better known. Whilst it is unlikely to be anyone's favourite apple, it might feature in a top 20. It has that key characteristic of a good apple, a harmony of sweet and sharp flavours which really works. I've had a tree of "Gavin" for 8 years now. I chose it because it was raised near my home orchard and in the year of my birth! In a good year I get a respectable crop of very well flavoured apples. A more complex flavour than most early apples, but in common with its peers, it does not keep well. Better than the day or so you get from a Worcester or a discovery but no more then a week or so in top condition and you can expect to go bad in about a month. Last year it was the best apple in my orchard for quality and flavour. However. The big drawback I have found is that it does tend to throw out tall, spindly branches which appear to be rather brittle. I get frequent breakages from weight of fruit by the middle of June, even with thinning and have to lash up emergency supports and repairs. Hence I wouldn't say its' a good tree for a beginner.